DTCs for the CAN communication system are as follows: U0073, U0100, U0101, U0123, U0124, U0126, U0129, U0131, U0142, U0155, U0164, U0182, U0199, U0200, U0208, U0230, U1002 and U1110. Refer to troubleshooting of each system if DTCs regarding the CAN communication system are not output. (a) Interview the customer and confirm the problem. CAN communication DTCs are stored when there is an open or short in any of the communication wires. Any problems with the power source of a corresponding ECU or sensor, or problems in the ECU or the sensor itself also cause these DTCs to be stored. 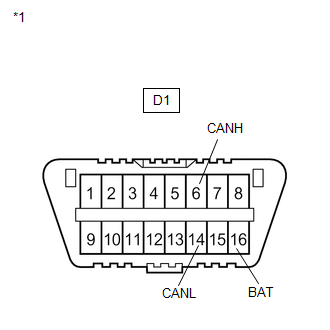 If a CAN communication wire connector is disconnected with the ignition switch ON, the ECUs of the corresponding system and related systems store a DTC. (a) Based on the vehicle equipment and specifications, confirm the systems that use CAN communication (See page ). (a) Select "CAN Bus Check" from the screen on the Techstream (See page ). (b) Observe the screen for approximately 1 minute to check the ECUs and sensors displayed on the screen. All ECUs and sensors connected to the CAN communication system are displayed on the screen. All ECUs except the main body ECU connected to the CAN MS bus are not displayed on the screen. The main body ECU outputs DTC U1002. All ECUs connected to the CAN MS bus are not displayed on the screen. All ECUs except the power management control ECU connected to the power management bus are not displayed on the screen. The power management control ECU (PM1 Gateway) outputs DTC U1002. The power management control ECU (PM2 Gateway) outputs DTC U1002. All ECUs connected to the CAN No. 2 bus and power management bus are not displayed on the screen. One of the ECUs and sensors connected to the CAN communication system is not displayed on the screen. Some ECUs and sensors repeatedly appear and disappear on the screen during this check. Non-installed ECUs or sensors will not be displayed. Do not mistake them for being in the communication stop mode. *1: See Diagnostic Trouble Code Chart instead of Communication Stop Mode Table when some of the ECUs connected to the CAN MS bus, power management bus and CAN No. 2 bus are not displayed on the screen (See page ). The ECUs connected to the CAN MS bus are displayed on the screen by the main body ECU. The ECUs connected to the CAN No. 2 bus and power management bus are displayed on the screen by the power management control ECU. Sometimes CAN communication system DTCs are output, but all ECUs and sensors connected to the CAN communication system are displayed on the Techstream. In this case, previous or history DTCs may indicate the cause of the problem. ECUs related to a problem in the CAN bus will store DTCs to indicate communication malfunctions. The communication stop mode in the CAN bus can be determined by comparing the combination of DTCs that have been set. Refer to DTC Combination Table for the CAN bus. 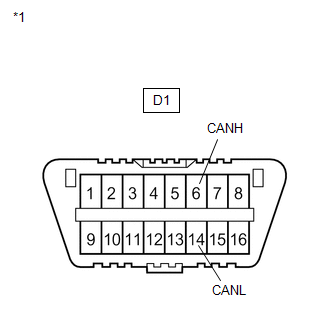 The main body ECU will store communication error DTCs when the ECUs connected to the CAN MS bus cannot communicate, or if a network malfunction occurs. 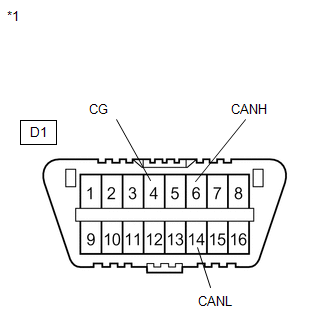 The power management control ECU will store communication error DTCs when the ECUs connected to the CAN No. 2 bus and power management bus cannot communicate, or if a network malfunction occurs. The main body ECU outputs DTC. The power management control ECU (PM1 Gateway) outputs DTC. The power management control ECU (PM2 Gateway) outputs DTC. Previous CAN communication system DTCs may be the cause if CAN communication system DTCs are output and all ECUs and sensors connected to the CAN communication system are displayed on "CAN Bus Check" of the Techstream.